There are many horses in modern day pedigrees that have become familiar names to us, and yet we’ve lost a connection with them as real racehorses who were stars in their day and who you could see perform live at your local racetrack. In past blogs I’ve dug up newspaper reports from the 1920s and 1930s on the amazing mother and daughter trotters Nedda and Nedda Guy, who appear in the maternal line of many great sires. I’d like to do the same with two great racetrack colts who were rivals in that the same era – Scotland and Spencer, who both went on to be very good sires and superb broodmare sires – a pivotal part of many maternal lines of top horses and sires of the modern era. Scotland over Spencer mares became a popular cross, so these two horses turn up in many of the best trotting and pacing pedigrees including Direct Scooter, Albatross and Cambest (see footnote to this blog). But hang on, I’m making them into “names in the pedigree” again! Let’s find them as “heroes on the racetrack”. And to do that I want to take you back to the Hambletonian trot of 1928 as reported by Tom Gahagan in The Trotter and Pacer magazine 6 September 1928. Remember that this is time in pacing and trotting where horses raced in heats on the same day – usually two but often three and sometimes even four to find an overall winner. In the first heat of the Hambletonian for 3yo trotters (described below), Spencer wins, Scotland is second. In the second heat, Spencer wins again, and Scotland seventh, tiring after a slow start and an amazing recovery. This was only the third Hambletonian raced, and it endures today as one of the highest staked prestigious races for 3yo trotters in America. 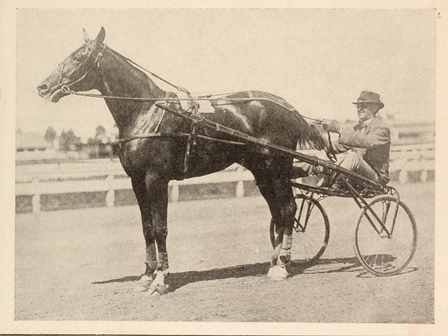 (I strongly recommend the website of the Hambletonian Society, particularly the wonderful collection of photos in their gallery: http://www.hambletonian.org/gallery.php). “Another Hambletonian stake, the third to be raced, has passed into history and the honors go to Spencer, owned and bred at Castleton by David M. Look and driven by the eastern reinsman William H. Leese. In a spectacular battle, the son of Lee Tide and Petrex vanquished a field of nine of the very best three year olds in the classic event at the New York State Fairgrounds track today (27 August) where nearly 30,000 people had assembled to witness the battle for a fortune and the racing honors of the season…..
For his efforts over the two heats, Spencer’s share of the stake was $40,549.71. Not a bad pay day. Although Scotland didn’t win the Hambletonian, in future five of his progeny would achieve that prize – including the wonderful Rosalind. Two years later (1930) the same writer in the same magazine reported on Scotland’s attempt on the Syracause track record when he went under 2 minutes for the first time in his career, going on his own against the clock. It was a perfect day weather-wise and the course in record-breaking condition. The dam of all three was Roya McKinney (one of three wonderful sisters, but more on them another time). On the pedigree side, because I can’t resist, it’s also of interest to see Spencer’s dam is Petrex, who was a grand-daughter of Ethelwyn and so traces back to the x factor heart gene of Eclipse. See my blog on Nedda, who also traced back to this great Ethelwyn/Kathleen family). Scotland as a 2 year old in Tom Murphy’s stable. He took his 1:591/4 mark in Septemeber 1930 as a 5 year old, driven by Ben White. He was bred and owned by Henry Oliver. 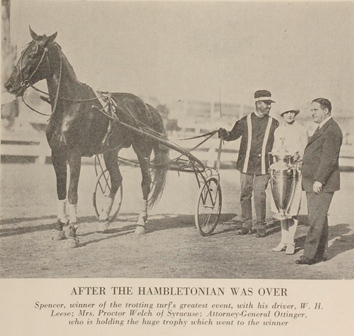 Three of the runners in that 1928 Hambletonian (Spencer, Scotland and Guy Abbey) became highly regarded sires, and they can often be found combined as sires and damsires and grandsires in the pedigrees of many top pedigrees. Hoot Mon, for example, has Scotland as his sire, and is from a Guy Abbey mare who has Spencer as her grandsire! Which goes to show the extended and successful siring careers these talented three year olds went on to achieve. Footnote: Just to jog your memory, Spencer was the sire of Spinster and therefore the damsire of half-sisters Lady Scotland (by Scotland) and The Old Maid (by Guy Abbey). Lady Scotland was the dam of Harold J (damsire of Cambest) and Breath Of Spring (dam of Race Time and many subsequent credits). And Old Maid was the dam of Dancer Hanover, Thorpe Hanover and Bachelor Hanover (who stars in so many New Zealand pedigrees) – and what wonderful broodmare sires they all turned out to be! Another excellent Scotland over a Spencer mare cross produced Emily Scott (dam of the very good trotting mare Emily’s Pride and grandam of the great trotting sire Noble Victory) and her full brother Spencer Scott (sire of Hoot Mon and Rodney) . In New Zealand of course we had U Scott (with Scotland as his sire) and Light Brigade (with Spencer as his damsire) and what a contribution they made. Photos in this blog are from the front covers of The Trotter and Pacer magazine of September 1928 and September 1930.